Yesterday morning, as I rocketed around the track at the YMCA, I watched the senior aerobics and strengthening classes moving to a musical beat in the gym below. Suddenly I thought of the early morning exercisers I had photographed in parks and on city sidewalks in China. They seemed so exotic to me at the time. People marching and playing drums early in the morning. Fan dancers and sword handlers, elders practicing tai chi and couples, mostly women, waltzing. What would a group of Chinese visiting an exercise class at the Y think about what they were seeing? Would they be snapping photos to take back home to show others how exotic American exercise classes were? The more I looked at the exercisers at the Y, the more I realized how many similarities there were between fitness programs in both countries. Between the aerobics class below me and my fellow walkers upstairs there were enough fitness enthusiasts of Asian descent to make a Chinese visitor feel at home. All of us were wearing sweat pants or shorts and t-shirts, just like those in the photos from China. Our aerobics class was built around simple dance steps, as was the Chinese ballroom dancing class. Students used various implements in their classes. Here, for strengthening they tugged on wide, elastic resistance bands, in contrast to the Chinese, who were waving fans and swords. 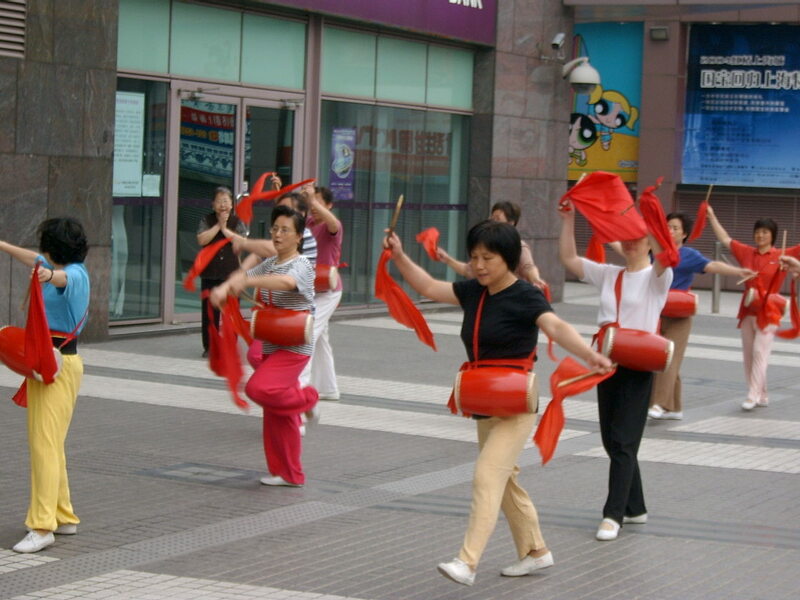 The ballroom dancers in China relied on a boom box for their rhythm; those at the Y caught the beat via a PA system. Participants in both locations could drop in to classes. Of course there are differences: exercising indoors versus out doors, for example, and paying versus not paying to exercise. The photos suggest the biggest difference between health aficionados in the two countries. At the Y I saw blue, gray and black, not a particle of red clothing or equipment. In China red was everywhere. Wikipedia says that for Chinese red symbolizes “good fortune and joy.” Wearing red may be the missing ingredient necessary to turn an occasional exercise program into a regular one, just what we need to bring us a little joy on a dark, cold morning when we would rather stay in bed. This entry was posted in exercise, health and tagged exercise, health. Bookmark the permalink.